Rule #1: Go in the door knowing what you want. Know the going price of what you want. Know what you are willing to pay for it. Regional price variances may come into play, so be ready for that. It is rare that you will see the "once in a lifetime deal" at a gunshow. Have your Blue Book along for the ride, but realize it's just a guide and two years out of date at best. I also keep a journal of prices I've seen in pawn shops on guns that have sparked my interest in some way. Often just recording a gun and it's price prevents me from having gun hunt fever. Finding the "deal" is a buck fever we all succumb to. You can prevent that with the price journal simply by making your find a record rather than a purchase. Rule #2: Be ready to negotiate, but not argue. Arguments are a waste of time, negotiations are not. Arguments are the end of negotiations. Prices are set by the owner, not the market. The owner can change them if he wishes. The trick is getting him to want to change the price. You will not do that by arguing. You can only do that by friendly negotiation. This is not a contest to see how little you can pay, but a negotiation to see if you can get the gun you want for a price you can afford. 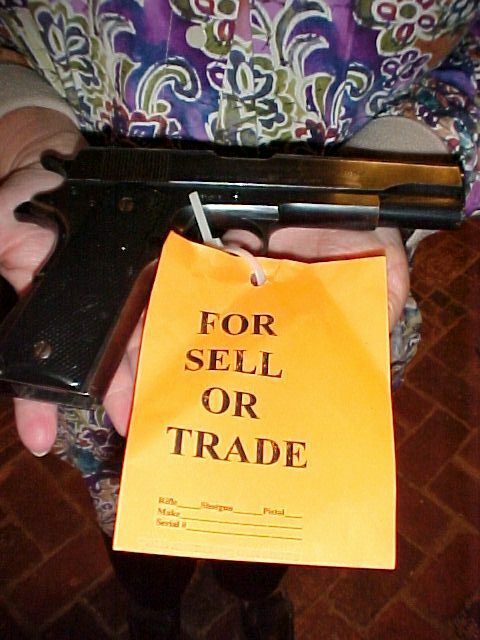 A gunshow is a seller's market for the dealer. If he does not sell, he might later at his shop or at the next show. Very few guns are unique. Most "unique" guns have a story. Buy the gun, not the story. Any historically attributed gun should have hard documentation. Any lettered gun, such as a Registered Magnum or a Lettered Smith should either have the papers, or the price should be adjusted. If the price is not adjusted, then the sale should be incumbent on the papers being accurate once received. Rule #3: Arrive early, and arrive again late. I try to be the first person to walk through the doors. The best table deals for a private purchaser are snatched up in the first hour or two. They also occur in the last hour or so as a dealer gives up on his prices and just wants to break even. Of course, by that time, the gun you wanted might be gone. It's a chance often worth taking. Cash is liquid, guns are not. On that first day, if I see a gun in the first few minutes of a show that I want, I call the seller over. I ask him if he would like to make a dollar a minute for doing nothing. Once he agrees, I give him 5 or 10 dollars to take the gun off the table for 5 or 10 minutes while I quickly walk through the rest of the show. Most of the time the seller is willing to apply this money to the gun's price when I return, eventhough I don't ask him to. At the very least it gets negotiations going in a friendly manner. I consider it a small price to pay to insure you get the gun you want. Rule #4: Carry cash. Carry cash in $20 increments, in several different pockets. It's easier to negotiate when the dealer thinks you cannot go any higher. Credit cards cost the dealer, as can checks. Your cash is attractive because he does not have to go to the ATM himself to keep dealing. It replenishes his supply of change. Cash is sure. If the seller will not negotiate, ask about a package deal. Will he toss in a holster? A box of ammo? Rule #5: Look for the private sale. 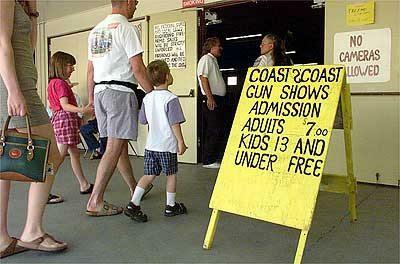 The gunshow is a buyer's market when it comes to the private sale. Approach the walkers. If you are not afraid of a private sale, this is where the deals can be found. The walkers want to sell. There are no taxes. Be aware that some of the jerky and beanie baby sellers may have a gun or two on the table to be sold as a private seller. If they, a non FFL seller, sells their own property, then it is a private sale. In other words, no taxes. My best deals have always come from private sales. Always. Likewise, do not ignore the small seller. He did not have to pay as much for one table as the other guy had to pay for ten tables. Guess which one will have to make a bigger profit break even? Often the little guy is just happy you stop to look. Rule #6: Make friends. Make the show enjoyable. Heck, people pay cover charges to enter a bar and buy a beer and converse with friends. Why not do the same to look at guns and converse with friends without the loud music? The more friends you make, the more deals you will find down the road. Realize that there are a lot of know-it-alls and wannabes and don't become one. I enjoy watching my wife at gun shows. She knows her stuff regarding her old Mil-Surp guns but does not advertise it. She can talk to anybody about anything, usually about how so and so's family is doing. She just goes to have a good time, and catch up with old friends, not to buy a gun. She always gets her money's worth, whether she buys a gun or not. That is the way it should be. I'd also suggest asking any seller before handling a gun. I do, and it always gets you off on the good foot with them.